This Scottish Quick Bread is said to have taken its name from the Stone of Destiny (or Scone), the place where Scottish kings were once crowned. The original triangular-shaped scone was made with oats and griddle-baked. Today's versions are more often flour-based and baked in the oven. They come in various shapes and flavor variations. 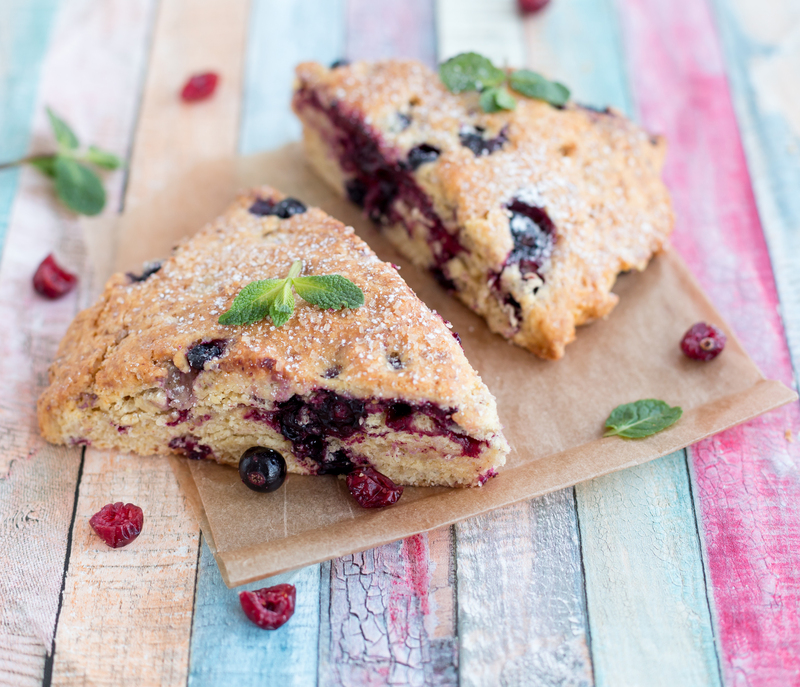 These soft and light scones are easy to make and so delicious, having a wonderful blend of berry flavors! Nothing is nicer than a scone just out of the oven with your favorite jam or marmalade along with some cream or a big dollop of whipped cream, or simply with salted butter. Mmmm... This has been an impressive winner each time I've served it--one of my personal favorites! Adjust oven rack to middle position and preheat oven to 400 degrees F.
Whisk together half-and-half and egg in large measuring cup until incorporated; reserve 1 tablespoon to small bowl for glazing. In medium bowl, thoroughly combine flour, sugar, baking powder, and salt. Cut in butter with pastry blender or knives until the dough is well blended but crumbly. Gently fold in liquid ingredients until large clumps, dough just comes together. If dough does not come together, add additional half-and half by the teaspoon until it does. Add berries and stir gently until combined. Turn dough onto lightly floured surface. Gently pat into 7-inch circle about 1 inch thick. Using bench scraper or chefs knife, cut dough into 6-8 wedges and set on parchment-lined baking sheet, spacing them about 2 inches apart. Brush surfaces with reserved egg mixture and sprinkle with 1 tablespoon sugar. Bake until golden brown, 15 to 20 minutes; cool scones on baking sheet on wire rack 5 minutes, then remove scones to cooling rack and cool to room temperature, about 30 minutes. Serve. Makes 6 to 8 scones..